While Facebook and Twitter have been following the majority of their users as they migrate to mobile, the third major player on the social networking scene, LinkedIn, has been considerably less aggressive on devices. The professionally oriented network wants its members and perhaps marketing partners to know that it is ready to catch up. The company released a considerably upgraded iOS and Android mobile phone app this week that emphasizes user personalization and brings forward the company’s growing content strategy. 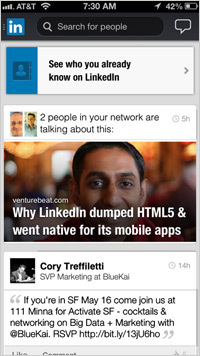 The version 6.0 of the LinkedIn app most notably adds a personal newsfeed as the default mode. Most of the feed is filled with articles highlighted and shared by the user's professional network of contacts. The app has highly accessible commenting and sharing tools, so that the user can engage in professional conversations as they are occurring. The new LinkedIn app emphasizes personalization. A slider menu lets the user add shortcuts that access more than a half a dozen key LinkedIn activities, such as one’s own groups, people who have viewed your own profile, news, and your own recent activity. With this release, LinkedIn is also emphasizing its international reach. The company says that 64% of its members are now located outside of the United States. The app update expands language support to 15. The company is promising to step up its mobile game this year. It states that additional updates to these apps will include greater search capabilities and even more personalization. There are no ads visible in this mobile app. Among all of the major social networks, LinkedIn is the only one with a direct subscription model for its members. When LinkedIn made its first mobile push a year ago, the company emphasized its reliance on HTML5 coding within the apps. But with this version, LinkedIn has created discrete native apps for each of the operating systems, which is similar to the retreat from HTML5 that Facebook made when it revised its apps last year. According to executives at LinkedIn, users were spending so much time within the mobile apps they were running out of usable memory, and so the developers needed the broader flexibility that native applications allowed.